FAFSA season officially starts on Jan. 1, which is when students who will be attending college in 2015-2016 can begin completing this critical financial aid form. Families must complete the Free Application for Federal Student Aid to qualify for need-based aid. The FAFSA is the federal financial aid form that roughly 20 million financial aid applicants complete every year. Sadly, millions of more families, who would qualify for aid, don’t fill out the FAFSA or don’t complete it. The federal government relies on the FAFSA to determine who qualifies for federal financial aid. The Pell Grant represents the major source of federal aid grants. It’s rare for a family with an income of $50,00 or higher to qualify for a Pell Grant. Even if eligibility for a Pell Grant or other smaller federal programs such as the TEACH Grant or the FSEOG Grant, is out of the question, parents will want to file the FAFSA if they wish to be eligible to borrow through the federal Direct Subsidized and Unsubsidized Loans and the Parent PLUS Loan. The FAFSA is also required if a child hopes to obtain a campus work-study job. States also often require families to complete the FAFSA to be eligible for state financial aid grants. The vast majority of colleges and universities also require families to file the FAFSA to be considered for their own in-house, need-based financial aid. Many highly selective schools, however, also require families to complete an additional aid form called the CSS/Financial Aid PROFILE. These institutions use the PROFILE to determine if applicants qualify for their own in-house aid. Here is the list of schools that require filing the PROFILE. Parents often wonder why they have to fill out the FAFSA if they are completing the more in-depth PROFILE form. Here’s why: the PROFILE application cannot qualify students for federal and state aid — only the FAFSA does that. You will access the application at FAFSA on the Web. As you can see in the screen capture below, all you need to create an account is the student’s name, date of birth and Social Security number. Before submitting the FAFSA, a parent and the student must each obtain a FAFSA PIN. These PIN numbers are required to electronically sign the FAFSA form online and retrieve the family’s financial aid records. The federal government releases the latest FAFSA on January 1 each year. It’s best to complete the FAFSA as soon as possible because colleges have financial-aid deadlines and so do states. 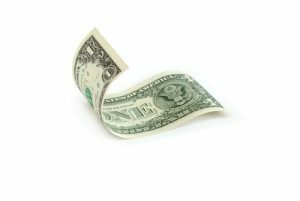 Some states, such as Illinois, Kentucky, North Carolina, Vermont and Washington, dispense money to eligible students on a first-come, first-serve basis until the money runs out. 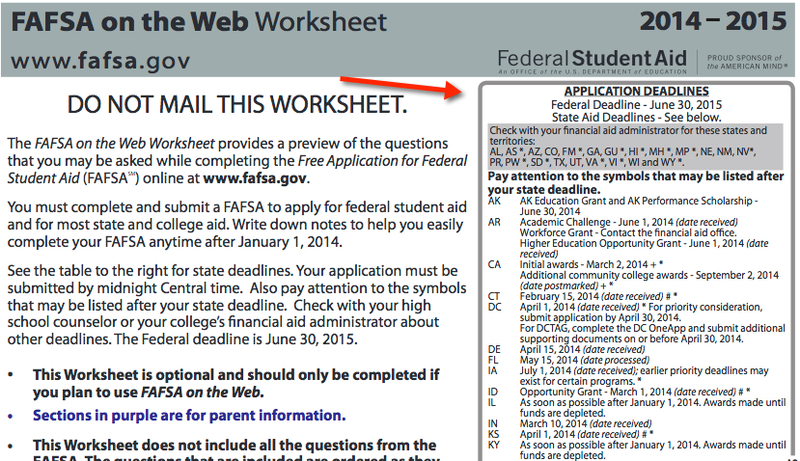 You can find out what the deadlines are for many states by looking on the front page of the federal government’s FAFSA on the Web Worksheet. The worksheet contains some of the FAFSA questions so it’s smart to check it out before tackling the real application. Below you’ll find a snapshot of the 2014-2015 worksheet’s front page with state deadlines. The 2015-2016 worksheet is not available yet. The aid deadline that you don’t have to worry about missing is the federal government’s. The FAFSA filing period is always 18 months and for the coming 2015-2016 school year, it will range from Jan. 1, 2015 to June 30, 2016. To complete the FAFSA, you will need your latest income tax return, as well as non-retirement investment accounts and bank statements. If you are up against an early aid deadline, you can file the FAFSA using estimated income tax figures. Once your taxes are completed, you will have to update the FAFSA. If you have a lower adjusted gross income – below $50,000 — you may qualify for something called the Simplified Needs Test, which doesn’t require that you disclose assets on the FAFSA. To be eligible for the Simplified Needs Test, you must be able to file a 1040A or 1040EZ tax form. The ability to avoid revealing assets can be a lifesaver for a family with little income (perhaps due to unemployment), but which possesses significant wealth. It can also be helpful for a divorced parent who has assets from a divorce settlement, but who does not have a good paying job. Families completing the FAFSA can speed up the process by using the IRS Data Retrieval Tool. When you reach questions concerning tax information, you will be asked if you have already completed your federal tax return and then you’ll be screened for your eligibility to use the tool. If eligible, you’ll be transferred to the IRS website to confirm the data transfer and then returned to the FAFSA. You can use the tool approximately two weeks after filing your taxes electronically. The tool does not become available until early February. 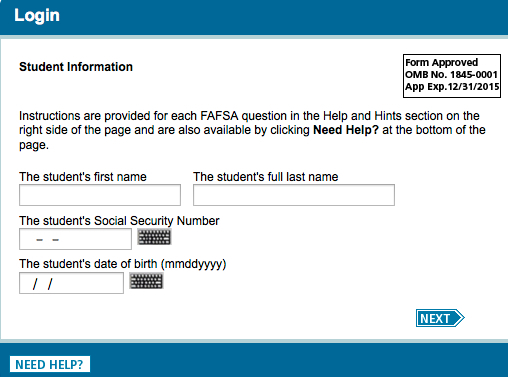 You can also use the tool to update a FAFSA application which you had completed with estimated taxes. Besides speeding up the FAFSA process, any data transferred from the IRS unmodified won’t be subject to verification. If you are married and filing separately. If you filed an amended return. If you filed a foreign tax return. If your home address on the FAFSA doesn’t match the tax return address. If you are filing the FAFSA in 2015, you also should NOT use the retrieval tool if you transferred a workplace retirement account into a rollover IRA during 2014. There is a bug in the retrieval tool and it will treat that rollover as income! If you are applying for aid for the 2016-2017 school year, the FAFSA will still be available beginning Jan. 1. The beginning date will be earlier – Oct. 1 for the 2017-2018 school year. My daughter will graduate from high school in June 2016. She has been accepted into ASU. Can I fill out a FAFSA now or do I have to wait until January 2016? You must wait until Jan. 1, 2016 to have access to the FAFSA for the 2016-2017 school year. I really enjoy your blog, books and webinars! A parent just asked me if she could start filling in the FAFSA and CSS profile NOW rather than waiting until Jan.1, 2016. Her daughter will be a first time freshman in Fall of 2016. What would you advise? If I will graduate high school in June of 2016, when do I start to fill out the Fafsa? is it the 2015-2016? You will be able to fill out the FAFSA for the 2016-2017 school year beginning on Jan. 1, 2016. My son is a senior in college and has applied to law schools. He has been accepted at several schools with some merit scholarship money,but has not not heard back from all his applications . He received a merit scholarship covering half his tuition for undergrad and we covered the remainder. We have one other daughter in college and another in high school. Our son going to law school will cover his education expenses from here on out. We note some law schools require parent information on the fasfa while others do not. I assume we can only fill it out one way ( either with or without parent info) …so this will require our son to provide that info to all the schools or none of them. It appears law schools provide less need aid than undergrad, but does provide some merit aid. Do you find this to be true? Is it in our son’s best interest to provide the fafsa with our info to all the schools he is looking at in order to be considered for need aid? why is this information required at some schools and not others ? He may require some federal loan money to finance a part of his law education…is the fasfa required for this too? Thanks for any advice. I am not an expert on grad/professional schools, but I think your son will find that all he will receive from law schools will be merit aid. The need-based aid that he would receive would be federal loans. If he wants to borrow for law school, he will want to complete the FAFSA since he would not have access to federal student loans without doing so. Federal students loans will be the best loans he can get because of the safety net he can enjoy if he, like many law school grads, can’t find a job or end up underemployed. If we are doing the FAFSA early, should we put colleges on the list that my daughter has not yet applied to (but is going to) or has not heard about acceptance? Yes she should put any college on the FAFSA list that she intends to apply to.